A woman who was flown to hospital by the Duke of Cambridge after being hit by a marked police van has died. She suffered head injuries when she was run over in Hethel, near Wymondham in Norfolk, on Thursday night, as police responded to a 999 call that had been made over fears for her welfare. 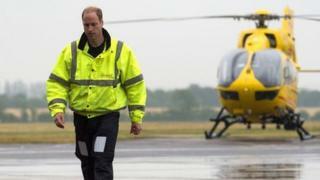 Prince William flew her to Cambridge's Addenbrooke's Hospital on his final East Anglian Air Ambulance shift. The woman, aged in her 50s, died there on Saturday morning, police said. No-one else was hurt in the crash. The case has been referred to the Independent Police Complaints Commission. The Duke of Cambridge is stepping down from his role as an air ambulance pilot to take on more royal duties on behalf of the Queen and Duke of Edinburgh.